“YOUS FELLAS FISHIN?” a Maori guy asked on the shore of lake Otamangakau. I said we were having a look. “Plenty a fish here, bro, big bastards too, but bloody hard to catch, ay.” He was lean and hard, dressed in a bush shirt and hunting shorts, and his legs and arms were scratched with bush lawyer and blackberries, the barbed wire of the backcountry. Behind him was a camp that looked like a mobile butcher’s workshop. Game carcasses wrapped in fine white muslin against blowflies were hung from meat hooks on all available trees. On a log his companion sat pulling an oily swab through the barrel of a large-calibre rifle. The man’s summary of fishing at the lake – big, challenging trout and plenty of them – was precisely what had attracted us here. Sure enough, we saw the first fish, large shape shadowing against a patch of dark-gold sand, as soon as we descended to the waterline. I was with Marc Petitjean, the Swiss fly tier and angling innovator extraordinaire but even his masterly casts and best-money-can-buy flies made no impression on this or any other fish we saw. The trout were weary, not giving us even one honest opportunity. Marc made a face of mock dejection. “This is not a place for casual drive-by fishing,” he said. “The trout here need to be studied and understood before anything of consequence happens.” I had to laugh. This was exactly what I had planned for the next few days. For now, we were just filling a couple of hours waiting for Marc’s afternoon flight to Christchurch where he was to give one last NZ fly tying demo. Before we left I went back to ask the fellas if there was anywhere nearby I could camp. 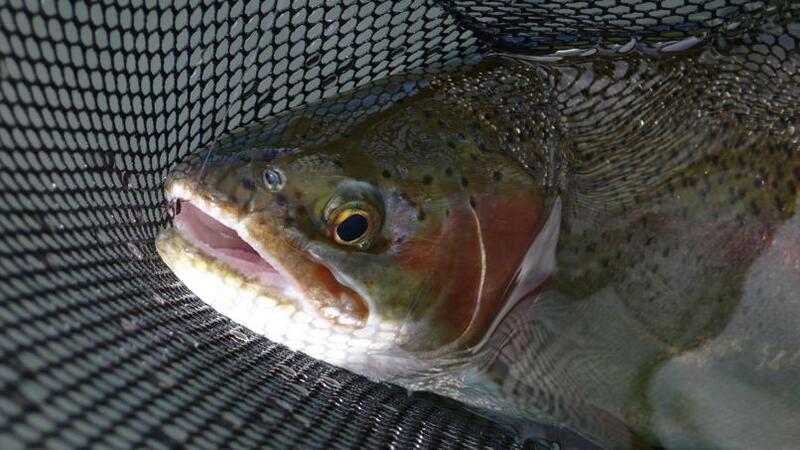 And so it began, my affair with the big O, its trout and the whanau that camps along its shores. With just enough foresight, I had borrowed a three-metre inflatable tender for the Otamangakau because the lake is an old swamp filled by the hydro scheme, and the shoreline fishing is limited to a few small and unconnected beaches. The rest of its margins are boggy and full of holes oozing muck and oily blackwater, quickly discouraging any exploration on foot. By the time I returned, set up camp and pumped up the boat it was already dark. One of the bros materialised, beer in hand, and unceremoniously put another one for me on the bumper of my truck. “Come and have a feed with us,” he said. When I joined them both by their great incinerator fire he picked up an enamel plate from a sheet of corrugated iron which served as a dish-drying rack and heaped it with venison steaks and token stalks of boiled broccoli. Then he took a dinged-up mug, half filled it with Jim Beam and handed them both to me. We ate in contented silence, the lake behind us so still, even the stars reflecting in it did not shimmer. These two, I thought to myself, were my kind of people. My tribe. The lake, shaped like a deformed three-toed footprint, is a soup of weeds, red, olive and blue damselflies and some 6,000 better-than-average brown and rainbow trout. 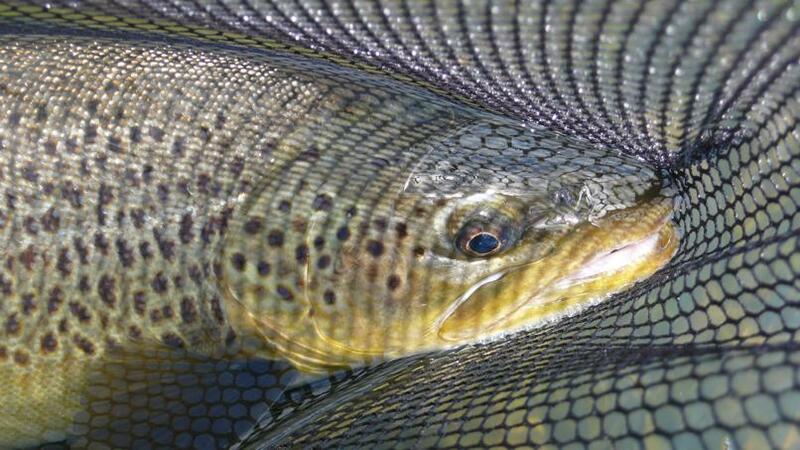 The numbers and sizes of fish are known because to enter the lake all trout have to pass through a fish trap where they are weighed and counted. That first day I failed my grades because, true enough, there were problems – many problems – most of them unanticipated. The first and fundamental was how to fish from a drifting boat. This is more complicated than it sounds. The fish I sighted prowling the shallows moved with speed and determination and the boat too had its own inertia. The moment I put down the oars to cast the boat would acquire a mind of its own, pushed and spun around by the wind and waves, and it would drift either away from the fish, or worse, directly over it. Then, of course, it wasn’t enough just to cast a fly to the fish. 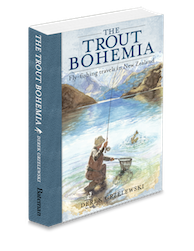 You had to put it a good few metres ahead, let things settle and wait for the trout to approach, by which time the boat had invariably drifted one way or another, dragging the fly or spooking the fish. After a morning of frustration and bungled opportunities I rowed back to the camp with a plan in mind. What I needed was a soft, quiet and quickly deployable anchor. This would not stop the boat from spinning but at least the vessel would not drift about or away. I found a canvass bag and part-filled it with stones, then I tied it to the transom on a length of rope. The most efficient way was to row with the anchor already overboard but above water, holding its coiled rope down with my foot. When I saw a fish I’d stand up readying to cast and slowly lift my foot and let the anchor slide down. The timing was critical as windows of opportunities often lasted only a few seconds. Then there was the question of tippet. On, say, 0.16 mm (6.6 lbs) you could hook more fish but there was no way to hold them. 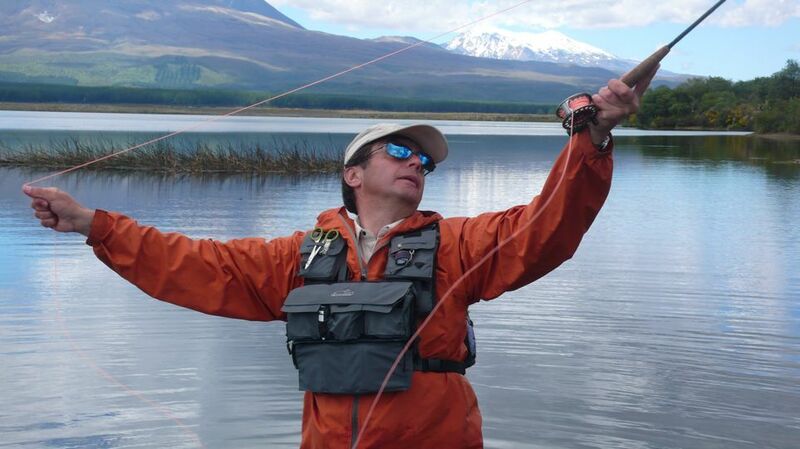 Stronger tippet elicited a lot of refusals but if the fish took the fly, there was at least a hope of landing it. The second day I managed to hook two fish. This, it turned out, was the easy part of fishing the big O. What followed each time was like an underwater explosion, as if the striking motion of the rod had set off a torpedo to which the boat and I were attached via the flyline. 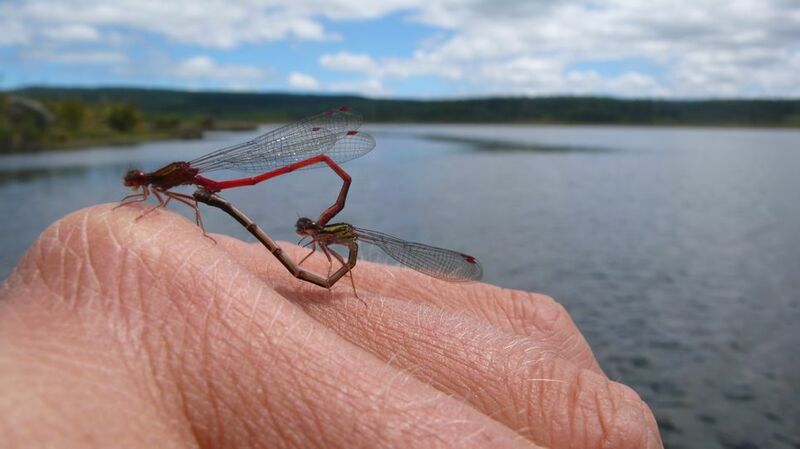 Ever wondered how damselflies do it? From the shallows where I hooked them the fish tore out for the open water and in disbelief I watched the backing vanish from my reel until the spool core was showing, all the while feeling that underneath me the boat too was moving, being towed out into the lake by the fish. Upon hook-up I had instantly weighed the anchor to have one less thing to tangle up with but after a few moments of slow biscuiting behind the fish I was once again anchored, this time with my flyline to the weeds some hundred metres distant. By then, the fish was already gone. That evening, as the lake was once again glassy flat and reflecting the pastel sky, a fish rose not ten metres out from the camper. I grabbed my rod, ran to the beach and cast, and the fish took without hesitation. The next thing the trout was airborne, bouncing off the surface like a basketball half a dozen times. In the evening stillness this sound of bricks being lobbed into the lake carried surprisingly loud and it roused the bros from their campfire seats. They all ran to the lake edge to see what was happening. The fish jumped again. Splash! It cratered back into the lake raising a fountain of water. Splash! Another jump, further off shore this time. Then the fish changed its tactic and it shot out into the lake, toward the islands. “Hang on to him, bro,” they shouted. “Don’t let’im…” but it was too late. There were extensive weed beds between us and the island and that’s where the fish was heading. The backing was down to half when it stopped moving. I reeled it in, trailing a handful of weeds. In the weeds was my light damsel nymph at the end of mangled tippet. Pierced by the tip of the hook was a tiny fish scale. Eventually I decided not to fish less than 8 lbs. With the Stroft tippet I was using this translated into 0.18mm and this proved to be both fine and strong enough. 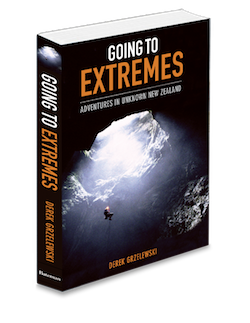 Later that night, I revisited the words of Otamangakau advice John Kent was imparting in his North Island guidebook. If you land one fish in four, he was saying, you’re doing really well. It seemed, I was making progress after all. One weather day I went back to a Turangi tackle shop to ask if there were any “Big O” secrets or tips they could offer. A friendly shop assistant/guide said he understood me only too well. Otamangakau offered many challenges but fortunately he had solid solutions to my dilemmas. He showed me how to connect a length of tippet to the leader with a triple surgeon’s knot but leaving one of the knot’s loose end uncut. To that I should tie a damsel nymph, he went on, then to the sharp end of the tippet a big buoyant dry, like a Wulff or a deer-hair caddis. Thus the nymph, suspended between the dry and the leader, around 10 cm below the surface, would imitate an emerging damsel, one about to get away and necessitating a quick and decisive take by the trout. To the hook bend of the Wulff I could then tie another length of tippet ending in a Pheasant Tail or a Bloodworm, then perhaps another piece with a small Woolly Bugger at the end of that. Such an assembly should be carefully cast over the edge of a weed bed, he suggested, then left hanging there until something happened. This was, he concluded, how most of the fishing was done at the O.
I thanked him and agreed that his set-up of four or five flies would most certainly catch fish, and good ones too. What I did not tell him was that in my case that “something” most likely to happen was that I’d fall asleep watching the rig. After you’ve been corrupted by the exquisite suspense of sight fishing, with its inherent voyeurism and intimacy, throwing clusters of flies at the lake seemed too much like long-lining, too tedious to bear. The camp population was growing steadily until the place looked like a small village, the tents of the whanau spreading out along the shoreline. Smoke rose for two or three permanent campfires and loud reggae music hiccupped from a ghetto blaster. A gang of kids roamed about, bored and looking for mischief, and they promptly made my camper their favourite hangout. I took a couple of them fishing and one, a ten-year old named Anaru showed both talent and passion. “Can you cast?” I asked before I rowed him out into the lake. We did find a few fish for him and Anaru cast to them the best he could. He was getting the length all right, but the fact that, in true Tongariro fashion, he was also putting his line on the water on every forward cast did not help our case. Once a fish was mildly interested but even that was a no sale. Later that day Anaru came by asking if I had any spare dry flies he could have. The Tongariro blackberries had claimed most of his precious Wulffs and Elk-Hairs, he reasoned, and in any case, it was his birthday tomorrow. I plucked a few standard-issue dries out of my box and he proudly pinned them into his. At his age, and with his income, losing a fly to the riverside scrub was a major financial setback. My inflatable now sported a five HP outboard, a surprising don’t-mention-it loan from my hunting brothers. The few halcyon days that followed were my best on the lake. After a long wait everything finally came right: the lake levels, the sunshine, the wind and the activity of the trout. By now, too, I’d acquired a certain critical mass of experience in fishing the big O, if not quite making the grades then at least being ready for the daily tests. A pleasant routine imposed itself over the days. I would push off around 9 am, when the sun was high, and row about retracing the contours of the lake, looking for trout. I’d motor back for lunch and a short siesta, invariably spent in the company of the gang of kids, then set out again and hunt trout until the light got too low. The fishing was never easy. Refusals and spooks were common but usually I could eke out three, four, sometimes five fish a day, landing about half. The combats were always fierce and long, every time well into the backing, often more than once. Until the fish was in the landing net, anything could happen, and often it did. One evening by the fire the bros asked me what I did for a living and I told them. This elicited a lively response. “Don’t you ever write about us two Hori fellas,” one of them said. But how could I not to brothers? It was you who made my stay here so memorable, though I was just as unlikely to forget the sight of 6-8 lbs trout cruising the thin water above the weed beds with aggression and purpose, their two top fins slicing the surface like knives. 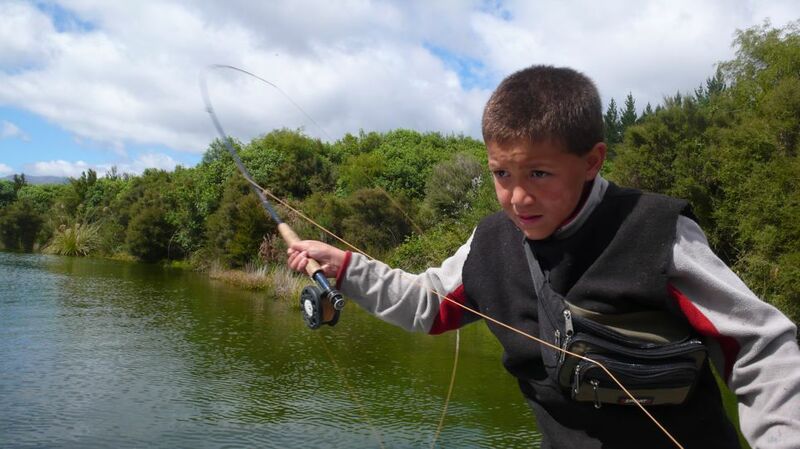 Or the speed at which the backing was coming off my reel, and above all the feeling of the boat being slowly towed out into the lake by another Otamangakau fish. 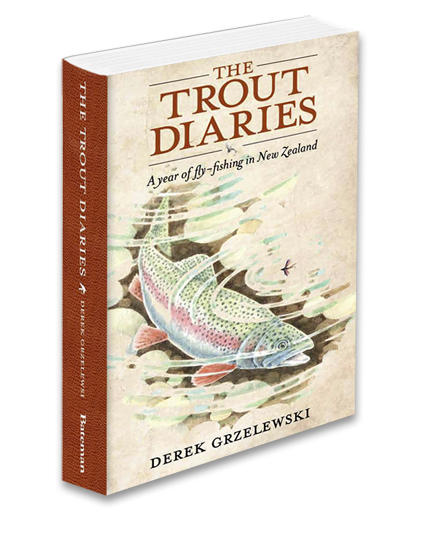 This entry was posted in Adventures, Books, Fly fishing stories, Technique by Griz. Bookmark the permalink. Have you ever seen anything this cool and original?